I drove over to Connecticut on Saturday to compete in my second and final Regionals for the season and had a great time as always. 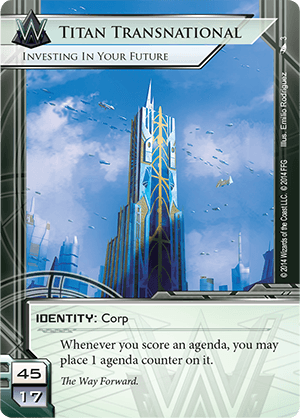 I say this a lot, but the people who play Netrunner, in my experience, are universally friendly and great to compete against. I always hear bad things about different competitive game communities, but haven’t seen any of that here. It’s fantastic. For the first time I had some success at a Netrunner tournament, particularly with this Titan Transnational deck which went 5-0 on the day and helped me to a 3rd place finish. My goal going into the season was to secure a playmat (usually given to the top 8) and I got one! It’s a really cool one, too, with art from Find The Truth. I spent about 2 weeks playing 30 games or so in the jinteki.net competitive lobby before finally committing to a build I was comfortable with. There’s room to change a few cards but I think it’s pretty well honed in on where it needs to be. Access the deck here, or look below. If you remember my deckbuilding tips for the corp side, the very first thing I recommended was to figure out your primary strategy to focus the deckbuilding. 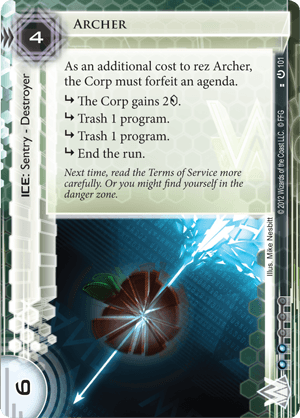 This may be one of the most focused corp decks I’ve ever made, and the name of the game here is speed. 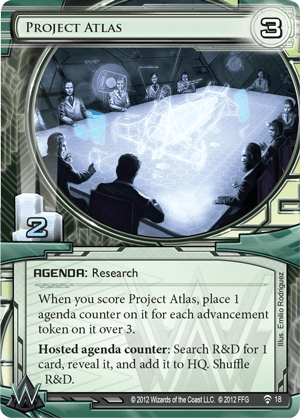 Ideally I should be able to win by turn 8-10 by utilizing Titan’s ability alongside Project Atlas to find the cards I need to keep scoring more Atlases. Everything else in the deck is focused on either that goal or on slowing the runner down in case I need additional time. I have 5 different cards in the deck that will allow me to fast advance (install and score on the same turn) a Project Atlas: 3 copies of Audacity and 2 copies of Biotic Labor. I also have 3 Hostile Takeovers, which can naturally be scored from hand. If all goes correctly I will only be scoring those agendas. The Global Food Initiatives are to force the runner into stealing at least 4 agendas in order to win and to reduce agenda density. We want to make their runs as inefficient as possible, and GFI is the best card in the game in that regard. Fast Track can help me recover from a slow start by finding the agenda I need, although I think I only used it once in the tournament. Cyberdex Virus Suite helps the strategy by helping get past Clot. Although I didn’t see any Clot at the tournament, there’s enough of it out there to help tremendously. Since this is such a fast deck, a lot of the tempo is built in. If you can score 3 or 5 points before the runner can find more than one breaker, then it puts a lot of pressure on them and they tend to make mistakes. I’ve also designed the deck to oppose the most common runners I expected to face at the tournament. Namely, Siphon-focused Whizzard or MaXX decks, which is what I did hit 3 of my 5 corp games. Because I expected a lot of Whizzard, I decided to forgo asset economy such as Mark Yale and use entirely operation-based econ (and Hostile Takeover). That’s not necessarily quite as efficient, but it is consistent, and having extra money in hand is nice when you’re facing a lot of Account Siphons. I also made sure I had a good balance of taxing and cheap end the run ice. Mausolus is often cheaper to run through than to break, so runners then have to spend an additional click to clear the tag if they choose that route. Sapper can punish early aggression fantastically, and Archer is the most efficient piece of ice in the game, so long as you have a spare Hostile Takeover to give up. If the game is going past the first dozen turns, I almost certainly will, because a rezzed Archer over a critical server will grind the runner to a halt, giving me more time to find the cards I need. Vanilla, Enigma, and Hortum make sure that I’m almost always able to put an end the run piece of ice on a key server at the beginning of the game. An ideal opening turn is to ice the most vulnerable central (usually HQ with all of the siphons around), ice a remote server with an end the run piece, and install an atlas in the server. Every once in a while they’ll be able to scrounge out a solution to get in on turn 1, but it’s worth the risk. Once you score the first Atlas you know you have the upper hand and can work on other protection. A big part of my strategy was reading the meta and guessing correctly that there would be a lot of Siphon Anarch with a sprinkling of slower Andy and Hayley builds. I knew I could probably rush faster than any Criminal deck, and maybe get past Hayley before she can install a serious Clot lock. Regardless, I faced Siphon threats a lot, which is why I included 2 Crisium Grids. Forcing people to run through annoying ice in order to spend 5 credits just to make their Siphon works is expensive, and most importantly, time consuming. I wanted to make sure I could find Crisium when needed. I also threw in a single Ark Lockdown to surprise Anarchs who sloppily throw away both of their Paperclips or Black Orchestras, and to try to remove Siphons away from the game before Deja Vu or Same Old Thing can bring them back. I was able to do the latter at a critical moment in the quarterfinal round, without which I probably would have lost. 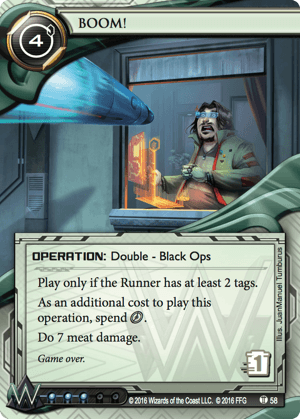 There are three main flavors to Siphon Anarch: standard Medium pressure, an Eater/Keyhole combo, and the new DLR/Counter Surveillance build, which is very scary, because it combines the standard DLR threat with ludicrous R&D digs in the late game. All three have the tendency to “float” (i.e. not care about retaining) tags, and the DLR build must accumulate tags. So I threw in a single BOOM! for those cases, figuring that I might be able to surprise a runner with an unexpected kill. While I was able to do this in testing, in the tournament setting it did more subtle, psychological work. See, I suspect that in a real-life tournament setting people tend to be a bit more conservative with their play than they otherwise would be. It’s embarrassing to lose a game to a risky play, but if you do it online, you can just re-queue and start over. In a tournament, not only are you losing in spectacular fashion, but you do it in front of a real-life person, and you might have to suffer the indignity of explaining the loss to a friend who asks how it’s going. So when you’re playing a Titan deck, you know that it’s going to be fast, but you don’t know if it’s using a Midseason-activated kill package as a backup strategy. If they are doing the latter, you need to be much more cautious about your money and try to find your Film Critic if you’re using one. The downside to that kind of build is that it slows down your fast advance game. You need to split your influence and cards in two different directions. However, having just the single BOOM in the deck did wonderful psychological work. Two of my opponents specifically told me that they played more cautiously after seeing (and trashing) the BOOM early in the game. I was wondering why they weren’t pressuring me more until they mentioned that. I hadn’t realized at the time it had such an effect. In my glowing review of Netrunner I mentioned that one of the reasons I find the game fascinating is because it’s a game of psychology. Despite finding that admirable about the game, I’m quite risk-averse in the competitive scene and tend to run very straightforward, safe decks. While this deck is straightforward, I was delighted to see a single card inclusion play such a big role in my victories. On the other side, when facing an extremely intimidating IG prison deck in finals, I succumbed to the psychological pressure myself and made mistake after mistake after suffering a bad bit of randomness. This is the game of Netrunner–no matter how good your decks are and how confident in them you are, you still need to play the psychological game. It’s fantastic.